Very nice everyone! Tomorrow is Spinners Flock so I'll be spinning for the first in months! I've spun one of the batts I got last week. Not sure if I'm happy with the color results. I may pull them apart and spin as sections of blue/white/brown. arg...ive been meaning to post this for AGES...but i keep forgeting. anywho, this is some cotton yarn i spun out of cotton balls as an experiment. it actually turned out really well! Its plyed with some shiny rainbow colored thread. my brothers girlfriend had just taught herself to crochet, so this was her present. Wow that cotton yarn is really cool! You really just used regular cotton balls from the grocery store? That's great! What she said. Love the rainbow thread you plied it with, too. The fibre is a super fine merino in 'Sea Beast' colorway- I got it from a fibre club on etsy and the name of the shop escapes me but that's ok the shop is closed now. I spun it up using a technique I read here- tear the roving into long thin strips, spin it up with minimal drafting, dunk in hot and cold water to felt, let it dry, then un twist. I'm so excited with how it turned out! erm, excuse the spot on the floor. About 150 yards, 4 oz. Mow I need to decide what to make with it! I always look forward to Fiber Fridays! Gina- I'm dying to see sherbert spun up. Maybe next Friday? Pmpkn- Welcome to Fiber Fridays. That's a really even third skein. Lamina- Sea Beast turned out great. What will you make with it? This Friday I made Stalactite. 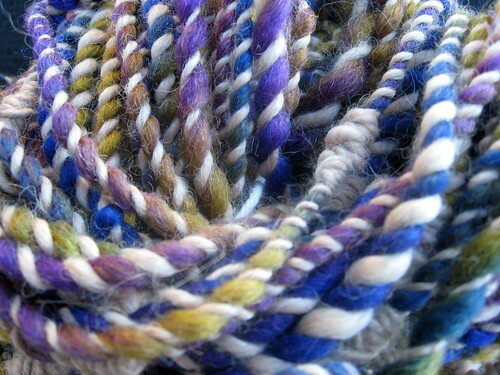 It's a blue, purple and olive green wool, plied with baby alpaca in knots. It's a teensy skein at 37 yards, but I had a great time making it! Everyone's spinning is so beautiful! And "Happy" is so fun! Everyone's yarn looks amazing!! I really love the colors of Rainbow Serbet and Sea Beast! aaah I havent had the motivation to spin in so long, but tomorrow i think I will spend the day spinning! I have to get some more dyes and I think Ill buy several pounds of fiber.